There is no way to ease the sadness of family and friends after a loved one dies, but making life a little easier for them allows them the time they need to come to terms with the situation. Gifts remind survivors that others cared about the deceased and are concerned about the family. Funeral gifts don't need to be elaborate. 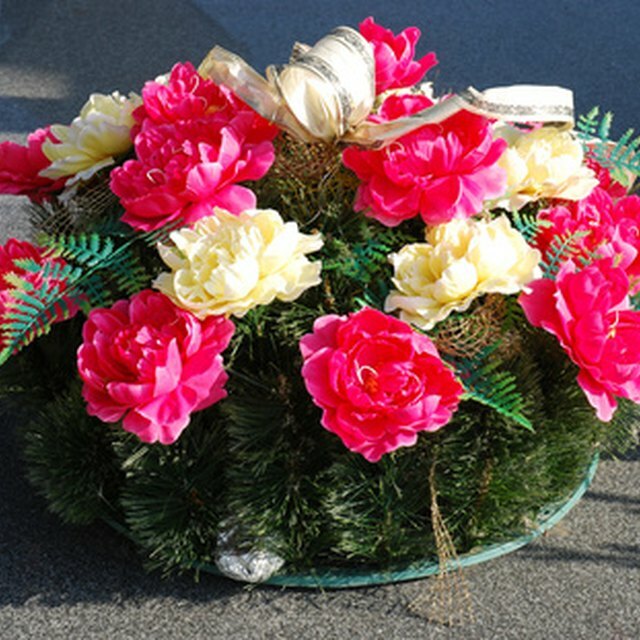 Traditional gifts include flowers sent to the home or the funeral location and food to be served at any gathering held after the burial. There are certain flowers more associated with death than others. In the Christian religion, a peace lily has a significant tie to Christ, representing the Virgin Mary and the Resurrection. Pink carnations indicate remembrance and white carnations represent innocence. Carnations are a good choice as they last longer than many flower bouquets. Gladiolas often are used in funeral sprays, which is the large setup of flowers near a casket or altar. If you choose to bring food to a home, make something that, in case of leftovers, is easy to pack in plastic containers for the family's future use. To feed mourners, stick to finger foods such as bagels, veggie sticks, crackers and cheese so those who want to move around the room to comfort others can do so. Bring a casserole that can be frozen and reheated for a meal later in the week. After a loved one's death, the immediate family likely is not ready to get back to the daily routine anytime soon. If children are involved, mourning adults may need to express their emotions but not want to let their kids witness it. If you live nearby, offer to babysit for a day or take the children for a weekend. Stop by to walk the dog, water the plants or wash some dishes. If visiting relatives are getting on the family's nerves, offer to take the relations out for a meal to give everyone some space. When the family is ready and wants to donate any of the deceased's personal belongings such as clothing, help with the packing, organizing and drop-off. Younger children might not understand what death really means. To help them through the process, purchase a book that deals with the subject in an age-appropriate manner, such as "When Dinosaurs Die: A Guide to Understanding Death," "Help Me Say Goodbye" and "Badger's Parting Gifts." A stuffed animal also might be comforting, but keep in mind that with some children, it might become associated with the sadness of the situation. For older children and teens, gift a journal to give them a safe place to write down their feelings and thoughts. If you know the deceased was a supporter or advocate of an organization, send a monetary donation in the person's name. For example, if the individual was an animal advocate, gift a check to a local animal shelter, the World Wildlife Fund or the ASPCA with a note explaining the situation and stating the deceased's name. If the person was in the military, consider a monetary gift to a VA hospital. Print or purchase a sympathy card; inside, write "A donation to (organization) was given in memory of (name)" to give to the family. Donor memorial plaques on items such as park benches, theater seats, trees and in religious institutions also may be available from some organizations to which you donate a large sum of money. Sheila Smith is a copy editor and writer with more than nine years of experience editing and writing for international media syndicate Tribune Media. Additional clients have included Times Union and Edgenuity. She has been involved with several nonprofit organizations, provided etiquette instruction for cultural and religious events and has experience in event planning. How Much Cash Do You Give for a Graduation Gift? What Is a Caregiver's Authorization Affidavit?